Iced tea is the perfect drink for summer and it can quickly be dressed up to create an even better and more impressive drink. Many of the best iced tea recipes are also the easiest, so don't think that you have to stick with that same tea you've been drinking for years. Whether it's a sparkling jasmine tea or a spicy lemon-ginger beverage, you will have a lot of fun this summer exploring these tea recipes. Each is cool, refreshing, and perfect for entertaining or enjoying on the patio by yourself. Summer fruits are a healthy and delicious addition to many iced tea recipes. 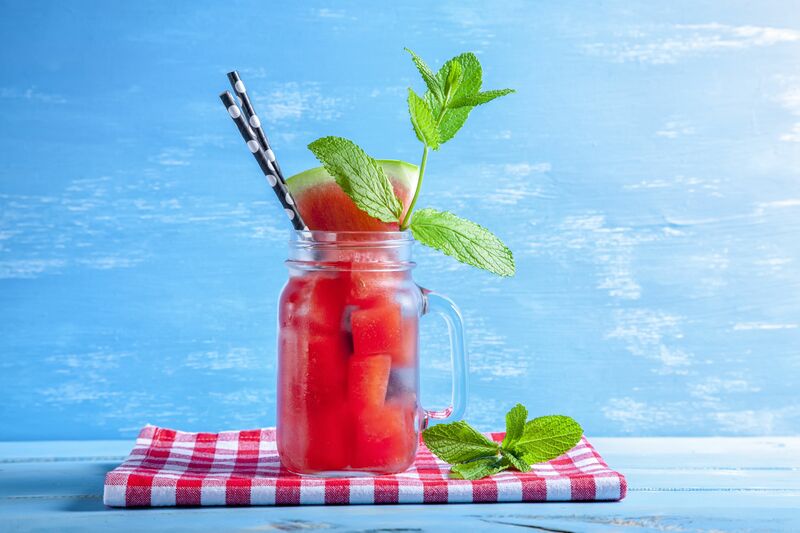 This flavorful, thirst-quenching watermelon iced tea is a favorite recipe for many tea lovers. Watermelon is a popular fruit of summer and this tea recipe is a nice way to use up any extra melon you may have left over. It's very easy to make and requires that you blend the melon with a little mint and lemon to create a watermelon agua fresca. From there, it's as simple as adding freshly brewed black tea. A fun twist is to use fresh strawberries instead of watermelon to create a strawberry sencha fresca. Either drink is fabulous and an ideal way to enjoy the fresh fruits of summer. Cucumber and mint are a perfect combination and this drink is an ideal way to enjoy both ingredients fresh from the garden. You'll be hard pressed to find a drink as cooling or refreshing as this one. Putting the cucumber mint green tea together is very easy. You will simply slice some cucumber and chop some mint, brew your favorite Japanese green tea, and combine all of it. If you have mint and cucumber to spare, use them to garnish each glass. It's an excellent recipe for summer garden parties. You can make this iced lemongrass tea with green tea leaves or tea bags. You'll also brew lemongrass to add a citrus flavor. It includes an Asian fruit, the kalamansi or Philippine lime. You can substitute your favorite citrus fruit if that is not available. The Arnold Palmer is a favorite drink for many people during the summer months and it's also one of the easiest recipes to play around with and make variations. The basic Arnold Palmer recipe is equal parts lemonade and iced tea. There's a lot that can be done with this simple base. Essentially, you'll start out with a black tea like Ceylon and build a homemade lemonade. Add some fresh mint for a simple variation. For a caffeine-free mint tea, try a mint herbal infusion. Or, you can begin with a jasmine tea for your Arnold Palmer. Creamy, spicy and cooling, Thai iced tea is a great choice for fans of iced chai lattes. If you have yet to taste an authentic Thai iced tea, you're in for a real treat. This recipe calls for whole spices rather than an instant Thai tea mix, which is commonly used. It begins with red or black tea (depending on your caffeine preference), then adds a fun array of spices before bringing in sweet milk for that full latte-like experience. Don't let the ingredient list scare you away from trying this iced tea. It's actually quite easy and if you miss a spice or two, it still works well. Many iced tea recipes can be transformed into a sparkling beverage with just a splash of carbonated water. A sparkling jasmine iced tea recipe is a perfect example. Brew your loose-leaf jasmine tea with lemongrass. Add a touch of simple syrup and sparkling water. The jasmine adds a nice floral twist to the average glass of summer tea. It's easy, delightful, and very refreshing. If you prefer, add a kiwi or mango or opt for this sparkling apricot iced tea recipe instead. You can even add a little brandy or rum to make your sparkling teas a little more interesting. Matcha is a very nice green tea option for creamy drinks. The recipe includes many tips and trick for creating a great matcha drink so you can create one that fits your personal taste. If you have not experimented with matcha powder yet, this recipe is the perfect place to begin. Ginger tea is invigorating and when it's iced, it is a great afternoon pick-me-up. The best news is that this lemon-ginger iced tea is surprisingly easy to mix up. The recipe begins with a homemade lemon-ginger simple syrup that gives this iced tea a fiery flavor. It takes just about 20 minutes to make and can be stored in the refrigerator until you're ready for a drink. From there, it's as simple as brewing your favorite green tea and sweetening it with your brand new syrup. Serve it hot or cold, depending on your mood. This is an elegant iced tea you might use for a party or when you want that special touch. You will use dried rosebuds and rose water for the subtle flavor and aroma of roses. Which Teas Traditionally Take Milk and Sugar? Can I Enjoy Rooibos Without Caffeine?